CURTIS ENGINE OFFERS FUEL TESTING, FILTERING AND TREATMENT SERVICES TO REMOVE WATER AND SEDIMENT FROM DIESEL FUEL STORAGE AND DAY TANKS. Fuel Top-Off Service- Add up to 75 gallons during the PM visit to keep the tank full and reduce condensation that forms on tank surfaces as a result of temperature changes. Contamination Test – Check for water and micro-organisms in the fuel tank. 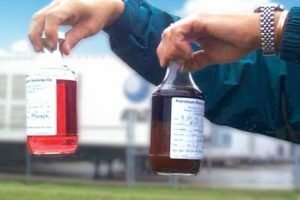 Fuel Quality Test – Check for contamination and also take fuel samples for lab analysis to determine diesel fuel quality. Fuel Filtering – Remove water and sediment from the fuel tank by pumping the fuel out and circulating it through a filtration system. Fuel Treatment – Add fuel treatment additives to add lubricity, eliminate water, stabilize fuel, prevent gelling, and help prevent sediment and tank corrosion. Fuel-related issues are the second most common failure point in emergency standby generator sets behind negligent battery maintenance. Stored diesel fuel begins to degrade within weeks of delivery and microbes begin to grow in the fuel. Water in the tank is inevitable due to condensation and venting. Contaminated fuel clogs fuel lines and filters and can harm the fuel pump due to a lack of lubrication. Fuel needs to be topped off regularly and agitated to prevent contaminants from clogging the system and starving the engine of fuel. Regular testing and exercise of the generator set help get the fuel moving but fuel treatment and recirculation – diesel dialysis if you will – actually removes the water and sediment from the tanks without replacing the expensive diesel fuel. According to NFPA 110 standards, the fuel system design for emergency and standby power systems shall provide for a clean supply of fuel to the generator set. A fuel quality test shall be performed at least annually. Additionally, fuel tanks shall be sized so that the fuel is consumed within the storage life, or provision shall be made to replace stale fuel with clean fuel. We recommend an annual tank cleaning along with the addition of fuel treatment. We have a dedicated fuel cleaning truck for larger tanks (up to 15,000 gallons) and portable filtering units for smaller tanks (less than 1,000 gallons). 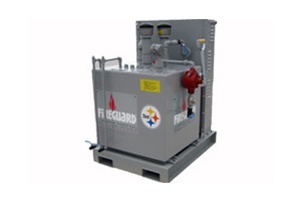 For tanks larger than 2,500 gallons, we recommend a stationary fuel recirculating system be installed. For more information on our fuel cleaning products and services or to schedule an appointment to have your tanks cleaned, please contact us today. Bacteria is caused by the presence of water and airborne microscopic bacteria spores usually introduced through the fuel tank vents. Many older diesel engines relied on the sulfur in diesel fuel to lubricate fuel injection equipment. Federal law now requires ultra low sulfur diesel with less than 15 ppm sulfur content. Additives are necessary to ensure that older engine fuel systems are properly lubricated. While Curtis Engine is a strong supporter of Green Energy and renewable fuels, bio-diesel is NOT for use in emergency or standby generators. As bio-diesel ages in storage, the acid number tends to increase and go out of specification. It becomes “gummy” and attracts moisture thereby clogging fuel lines, filters, and injectors. Even blending B100 bio-diesel with regular diesel to make B20 bio-diesel is not recommended. Some studies suggest that compared to B100, it appears that B20 may have a longer storage life than B100. Data also shows that some B20 can have good stability while others do not depend on the B100 used for blending. The National Bio-Diesel Board recommends that B20 be used within 6 months. If B20 is used, add supplements to boost cetane and to act as an anti-gel to improve stability and consider fuel cleaning at least twice per year. Sub-base tanks, day tanks, pumps, floats, vents, valves, and regulators.